At OK Apartment Barcelona the holiday apartments and monthly rentals agency, we made a survey of 850 expats that have lived in Barcelona for at least 3 months. Participants responded to the question "What do you least like about the city?" in an open-ended question and in the upcoming analysis we have summarised these answers into 9 negative factors. The biggest named defect in Barcelona amongst expats was its mass tourism. Over 1 in 3 respondents (34%) that live here affirmed that the city has a level of mass tourism that they dislike. Other relevant negative factors that appeared include local character (26%), pollution (19%), and the economy (16%). Analysing this question we arrived in a natural way to the problem of the amplification of tourism. In this article we we define the problem of Barcelona's version of mass tourism and outline the solutions being taken by local authorities by which we propose a new motion of action. We include an infographic as a graphical summary as well as video interviews with expats. Do you agree with the respondents of this survey? You can leave a comment on this page. 2 Open-ended question. Open-ended answers. 11 What do different nationalities dislike about Barcelona? 14 Want to use this infographic on your website or blog? The survey includes 850 people of 26 nationalities, with the requirement that they have been living in Barcelona for at least 3 months. The survey includes a total of 20 questions and in the next upcoming press releases we will analyse more questions including the reception from the Catalans, what expats like most about Barcelona, opinion on the referendum on self-determination, and interest and knowledge on the local Catalan language. Respondents commented everything they dislike about Barcelona in an open text in which they mentioned one, two, or three negative aspects. No-one mentioned more than three and the average was 2.1. To give more value to the results of this question we avoided giving a closed-list of predetermined answers. We categorized the answers and 99% of them can be summed up within 9 negative factors about the city which are numbered throughout this study. Answers such as "I like everything" and "I don't dislike anything" where not counted. There were a total of 646 valid answers. According to the country of origin, the number of valid answers were: Italy (242), France (164), Germany (72), Russia (50), Denmark (36), Argentina (28), and Poland (22). We did not take count nationalities for which there were no more than 20 answers. What do you like least about Barcelona? The negative factor by far mentioned the most was mass tourism. Just over one in three expats (34%) affirm that Barcelona has a level of mass tourism that they do not like. A lot has been written on mass tourism in Barcelona, but this is the first time it has been done soley from the perspective of expats many of whom started off their time in the city as "outsiders", allowing them perhaps to form a more objective view on Barcelona's weak points. The infographics demonstrate that amongst the surveyed nationalities it was Polish (54%) and German (38%) expats that had the highest percentage that disliked mass tourism. The nationalities that were bothered the least by mass tourism were Russians (26%) and Argentinians (25%). "Excessive mass tourism" / "Too much tourism all-year / "Selling the "BCN brand" has made the city into a theme park" / "Many tourists. Too many promotors." / "Tourists come and look at the city as their own", / "Misbehaving tourists"
We consider the problem in 3 steps: The data, the problem, and the solutions. Barcelona is a city with less than 1.6 million habitants and is now receiving more than 8 million tourists each year. The growth is noticeable; 1.7 million tourists in 1990, 3.1 million in 2000, 6.3 million in 2006, and over 8 million in 2013. It's the 4th most visited city in Europe after London, Paris, and Rome, despite being smaller. It has the leading cruise port in the Mediterranean. However, it has come to depend on the wealth produced by tourism, which accounts for 20% of its Gross Domestic Product (GDP). The main problem is the sustainability of tourism and the effect it has on the quality of life for citizens. Growth in tourism has transformed certain parts of the city such as Barceloneta, Las Ramblas, the Sagrada Familia, and Park Güell areas. Many local neighbourhood shops have shut down and been replaced with souvenir stores, bars, and restaurants. An increase in housing prices owing to homeowners renting out at a higher rate to tourists, foreign investment eating into housing stock, and inflated asking prices accounting for lack of knowledge of the local market amongst immigrating buyers. Exasperation caused by noise, foot traffic, and behaviour of some tourists. The consequent exodus of locals. For some time, local authorities have been taking measures to mitigate the negative effects of mass tourism. Current policies however, are mainly aimed at the regulation over the supply of accommodation. In 2005 licenses were suspended for renting tourist apartments in the area of the old city and in July 2015 all accommodation licenses were suspended prior to a plan to create a regulator for the sector. On 23 February 2016, an outline for such as regulator was presented called Pla Especial Urbanístic d'Allotjaments Turístics (PEUAT) or Special Urban Tourist Accommodation Plan. This regulator will control all kinds of accommodation including hostels, hotels, Bed&Breakfasts, and apartments. 73 neighbourhoods in Barcelona exceed 6.4 tourist beds for every 100 habitants. It is intends to reduce the supply of tourist accommodation in the city center, maintain levels in the surrounding areas, and increase it in the rest of the city. New tourist accommodation may not replace any home that has had an effective residential use before the precautionary suspension of licenses last July, 2015. Through accommodation, the council wants to encourage equitable sharing of tourism's benefits throughout all parts of the city while decongesting areas under a larger environmental and social pressure. We have many years of experience in the field of tourism and know that many visitors are interested in experience an authentic and un-touristic version of Barcelona, but don't due to lack of awareness. Accommodation in further parts of the city isn't enough to get visitors to detour to these areas and outside the city. New York, for example carried our a campaign called Neighborhood x Neighborhood. In the most visited American city, in 2013 they designed a campaign to encourage visitors to discover the offering in 5 neighbourhoods beyond Manhattan. Thanks to this they spread visitors throughout these areas, which have benefited from the increased economic activity. Another exemplar campaign from New York is more recent one called "Unlock NYC", which adds a focus of not just on spreading tourists across space, but time also, by inviting tourists to visit during off-peak seasons. Something that hasn't yet been done in Barcelona, encouraging tourists to see the benefits of visiting in the winter despite the differences in weather. Along the lines of Neighbourhood x Neighbourhood, Barcelona has a similar but isolated initiative in the Horta-Guinardó district - 10 routes related with history, beautiful views, and culture of the area. But as is plain to see, it's only available in Catalan, meaning it is practically inaccessible to tourists. A political will is needed to universalise initiatives like these and promote the activities in areas beyond the usual scope of tourism. "Closed-minded people" / "People with worried faces and sadness..." / "The coldness of people" / "The stubborness of people, which sometimes turns into obtuseness" / "People are a bit closed, unwilling to welcome newcomers in their circles of friends"
"Traffic and contamination" / "Noise" / "Noisy neighbours" / "Sound pollution" / "Too much dirt on the street or at garbage collection points!" Those that comment on this factor most are the German (25%) and French (23%) respondents and those that comment least were Polish (9%) and Russian (6%). "Work conditions", "No jobs", "Poverty", "Salaries, injustice for workers, and being treated like rubbish", "The wages"
According to the latest study from the Centre of Sociological Investigations in Spain, people who live in Spain worry mostly about unemployment (78.8%), corruption (43.7%) and the economy (25%). We would have expected a higher percentage of respondents concerned by economic factors, but perhaps a logical reasoning behind this is that in order to get a NIE now in Spain (an ID number for foreigners), you need to either be economically stable (with more than €5000 in your bank account) or have a job here. "Pickpockets and bike thieves" / "Danger in some areas" / "People are often robbed"
"Catalanism" / "If I speak Spanish, I would like that to be respected." / "Nationalism"
"Difficulties dealing with paperwork" / "Administration"
"Police look at the time, then do nothing." In the video below we present an audiovisual survey and some comments from expats living in Barcelona who have not participated in the survey. It was recorded on 15 February 2016 in Raval, Gothic, and Sant Antoni areas. We highlight a response coming from Ciutat Vella, where the streets are narrower and probably dirtier than other neighborhoods. "The people are a bit dirty... Barcelona is the city that smells of marijuana or pee." Take a look at see what other people had to see about the city too. 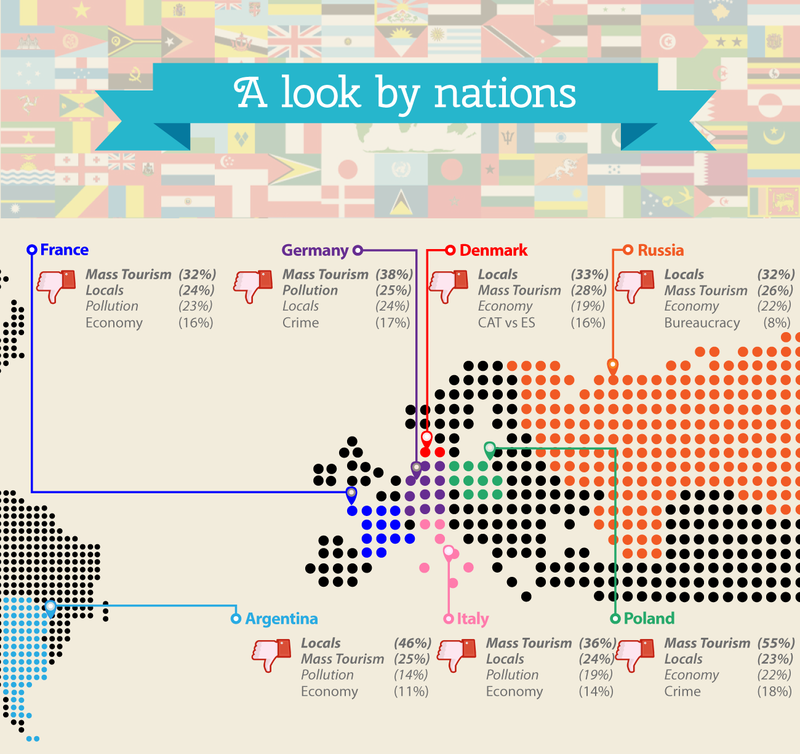 What do different nationalities dislike about Barcelona? The survey was carried out between the 1 June and 31 December 2015. 88% of respondents used an online form and the remaining 12% printed paper. Motives for moving to Barcelona: Personal relation (24%); university placement/apprenticeship (17%), found work (17%), studying (11%), looking for work (10%), other motives (21%). Intention to stay in Barcelona. Very few want to leave: I want to stay (61.19%), I don't want to stay (6.77%), I don't know (21.89%), I'd like to stay but I can't (10.16%). 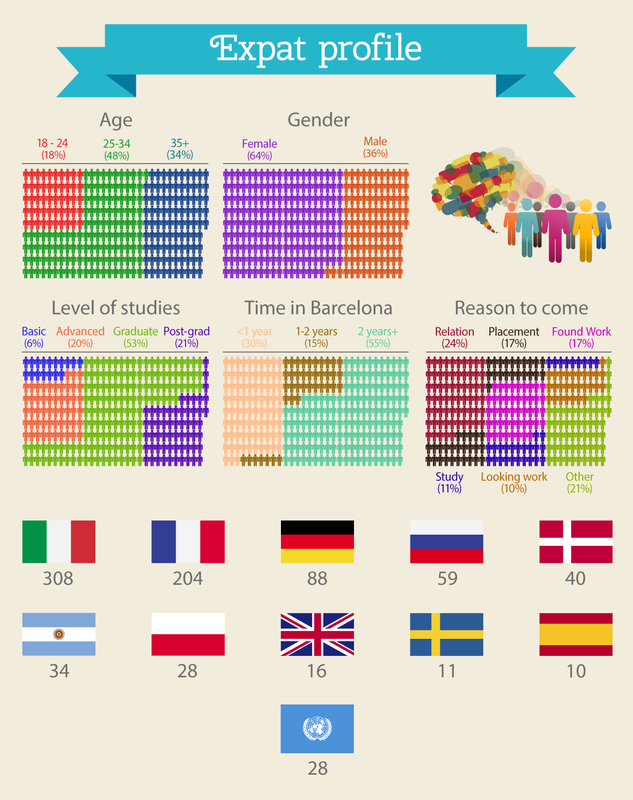 Full infographic - What do expats dislike about Barcelona? Want to use this infographic on your website or blog?